Freshman pitcher Jacob Meyer pitches during a baseball game Wednesday night against Coppin State. In its final non-conference matchup of the season, baseball routed Coppin State by scoring 16 runs in the opening five innings of the contest. The Colonials (26-18, 10-5 A-10) tallied 19 hits and captured 12 stolen bases in their 16-5 win against the Bald Eagles (17-21-1) at Tucker Field Wednesday. GW was aggressive on the basepaths from the first pitch, stealing five bags in the bottom of the first inning alone. Six Colonials recorded stolen bases with senior third baseman Isaiah Pasteur snagging a game-high four. Head coach Gregg Ritchie said the aggressive strategy on the basepaths was a product of his team’s awareness on the field. 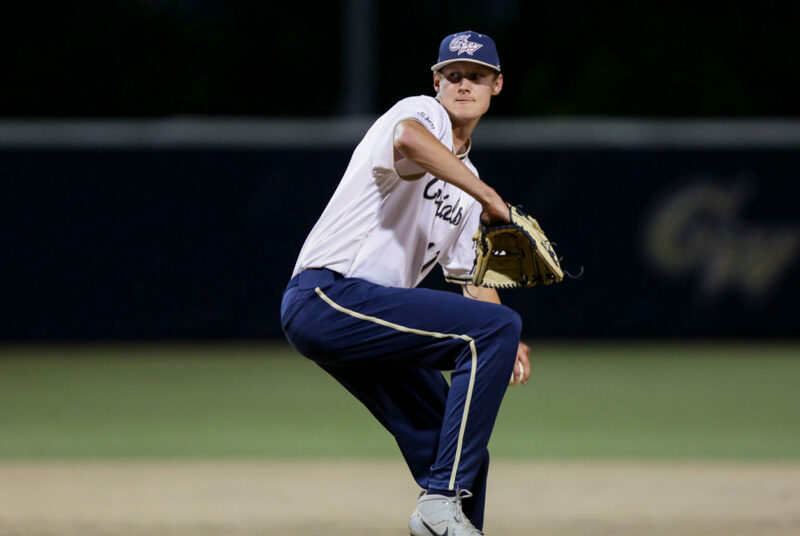 In his first appearance on the mound since March 9, sophomore pitcher Emmett Harkins gave up two runs after facing only the first three batters of the game. He settled down in the following three frames, retiring the next nine batters in order before getting relieved in the fifth. Senior pitcher Chance Malek replaced Harkins on the mound in the top of the fifth inning and earned the win after holding the Bald Eagles scoreless in his one inning of work. Inside the batter’s box, the Colonials started the game hot. After trailing by two runs in the first, GW’s offense took its first lead in the bottom of the inning. A single by sophomore infielder Steven Barmakian sent Pasteur over home plate to put the Colonials on the scoreboard for the first time. Junior utility player Dominic D’Alessandro then hit his fifth home run of the season to put the Colonials ahead 3-2, a lead they never relinquished. Pasteur, who holds the highest batting average on the team at .376, extended his hitting streak to 32 games with a single in the third inning. He suffered a hand injury when diving back to second base on a pick-off throw and exited the game in the bottom of the fifth inning, which Ritchie said was precautionary. GW’s early lead allowed more Colonials to see time on the field. Six different pitchers took the mound and ten position players recorded a hit. Redshirt junior first baseman Sam Martin – who has seen action in 15 games so far this season – recorded his best offensive performance of the year, connecting on four hits in five at-bats with three runs batted in and two runs scored to lead the team’s offense. Sophomore pitcher Billy Grant appeared in his first game of the season, recording a hit in his only at-bat. Coppin State picked up runs in the sixth and seventh innings. But GW’s early-game lead proved too much for the Bald Eagles to surpass. The Colonials will close the regular season with conference series against George Mason, VCU and Saint Louis. They are currently in fourth place in the Atlantic 10, with the top six teams advancing to conference playoffs at the end of the season. The Colonials will continue their homestand Friday in the first of a three-game series against George Mason at 3 p.m.